Leading HVAC air dispersion systems manufacturer, DuctSox, has announced the availability of DataSox for Data Centres. It is the HVAC industry’s first customisable air displacement ventilation ductwork system with onsite directional-adjustability for effectively and energy-efficiently cooling commercial data centre equipment. 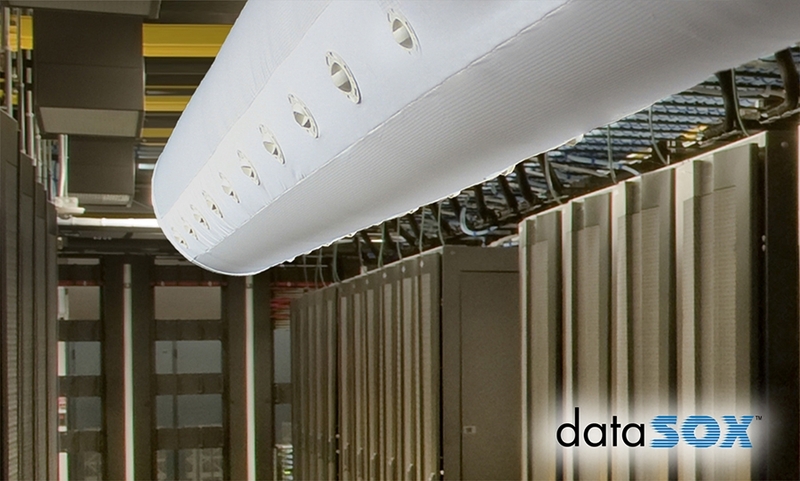 DataSox is a round, overhead and porous fabric HVAC duct system that distributes a large volume of air down into data centre cold aisles, but with low 400-FPM velocities that don’t upset critical equipment intake and exhaust or room return air containment balances. It also offers the flexibility of directional spot cooling capabilities with adjustable nozzles for high wattage servers. The nozzles allow for onsite testing and air balancing for optimum performance not previously available to the data centre industry. DataSox outperforms conventional air distribution methods with its factory-engineered, energy-efficient ¼ to ½ inch w.g. of static pressure and results in cold aisle temperatures 3°F to 5°F lower than traditional distribution, but with up to 40 per cent less computer room air conditioning (CRAC) flow rates, especially when complemented with variable frequency drive (VFD) equipment. Using DataSox helps data centres achieve lower power usage effectiveness (PUE) levels, which makes it a perfect sustainability product for green construction projects. More traditional data centre air distribution methods, such as overhead metal duct/register systems or under floor air chase plenums fall short of DataSox in overall efficacy and PUE. Large air velocities common among overhead metal duct/register systems typically cause turbulence and return air containment disruptions, resulting in equipment heat build-ups in under-served parts of the rack. Under floor chases are either too crowded with communication and electrical cabling or can’t efficiently force upward the increased volume or air required for higher capacity servers. For more information, please Contact Us or visit our DuctSox Product Range.